In this chapter, the wave-forced dynamic response of silty seabed in the subaqueous Yellow River Delta is thoroughly studied. Dynamic triaxial test and self-designed field wave simulator were employed to study the wave-induced pore pressure using sediment sampled from the field or directly in the field. Sediments were found to be sensitive to pore pressure build ups and could experience totally liquefaction under extreme wave conditions. Wave-induced pore pressure develop models were therefore constructed; influencing factors on the liquefaction properties were also identified. 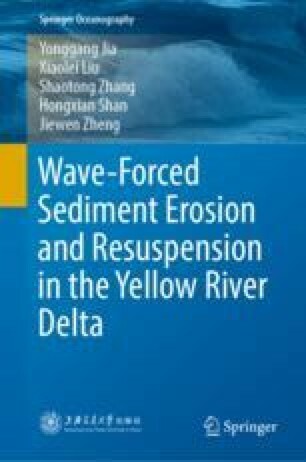 This chapter is the transitional section in this book which collected the wave-seabed interactions to sediment erosion and resuspension in the modern Yellow River Delta.